Want to know how to set the perfect table? This quick and easy guide will show you what goes where and what you need. First and foremost, you need to find out how many people you are setting for. This will allow you to determine the exact number of guests as well as how many individual place settings you need to create. Next, ensure you have a table that is big enough for your guests and that you have enough comfortable chairs. Cover the table with a plain tablecloth and spice it up by adding colorful place mats for each setting. 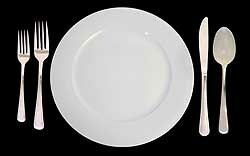 Set a standard dinner plate in the center of each place mat and a side plate for each person to the left of the dinner plate. Note that the side plate and dinner plate will not both fit on the place mat, so you will need to place the side plate off the matt, but to the left of the dinner plate. Place a knife and fork at each setting. Forks will go on the left-hand side, closest to the dinner plate, while knives will be set on the right, with the blades facing inwards. If you would like to include a salad fork, place it next to the dinner fork on the outer side. If you would like to include a spoon for soup or dessert, place it next to the outer side of the knife on the right. Try to line up your cutlery, so that it looks neat and tidy. The best way to do this is to have them aligned center horizontally. Place glasses on the right-hand side of the dinner plate, above the knife. If you are serving red wine, ensure you have red wine glasses. The same goes for white wine. If you are serving both, ensure you have both glasses available. Place linen napkins in a napkin holder, or simply fold them and set them on top of the side plate. Ensure you have placed all required condiments such as salt and pepper in the center of the table, or if you have a larger table, two sets, one on each side of the table.